Giddyup little doggie! If you're hittin the wide open spaces of the west you're going to want a lid that makes you look like a bonafide western hero. This Black Cowboy Hat will do the job! Once your outfitted with your cowboy gear, you won't have any trouble slipping into the saloon for a whiskey. Tame the west with this costume hat! Do you love quoting Clint Eastwood from The Good, The Bad and The Ugly but worry about your clean cut appearance ruining some of the grit and badness of those clever lines? Next time, put on this adult cowboy costume, paint a little stubble on your chin and try sounding a little more grouchy when you say, "Every gun makes its own tune." It's a tough life in the Old West. You finally saved enough silver to make it to Kansas, only to have a bandit outfit rob you blind. But you've still got your horse, your rifle, and a whole lot of attitude. Keep heading west and hope those bandits cross your path. Their criminal run will be over when they cross your path - the bounty is stated as dead or alive! Alright partner, this is a stick up! This Adult Ole Cowhand Cowboy Costume will make you a ruthless gun-toting cowboy! Sherrifs and law-abiders don't stand a chance once you bring the chaos. 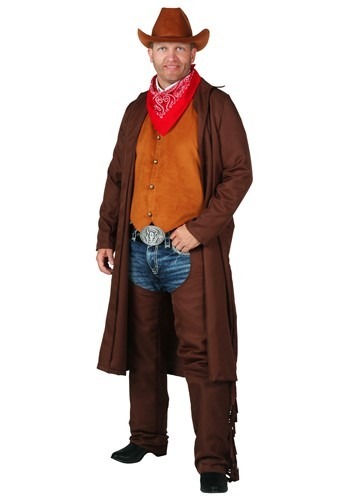 Pick up this Adult Ole Cowhand Cowboy Costume to make the other cowboys and cowgals chuckle! Are you the kind of girl who knows how to work a lasso? Can you ride a bull in your sleep? Is your other car a pony? Even if you answered no to all these questions, don't let that keep you from following your dream of being a cowgirl. All you need is a cute rhinestone dress and a cowgirl hat, which both come in this sweet package. Do you get accused of horsing around? Bring your stuff with this Adult Ride a Horse Costume. You'll finally have the means to mosey on down to the saloon for sarsaparilla. Even real cowboys would be impressed with your skills when you tame this wild stallion. 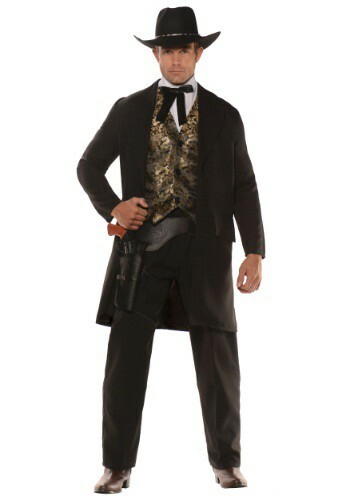 Make em' reach for the sky now that you're wearing this Authentic Western Gunslinger Costume. Accessorize your look with a cowboy hat and Maverick Gun Holster Set. You'll have to find your own trusty horse and hours of adventures! We're sure you can manage. 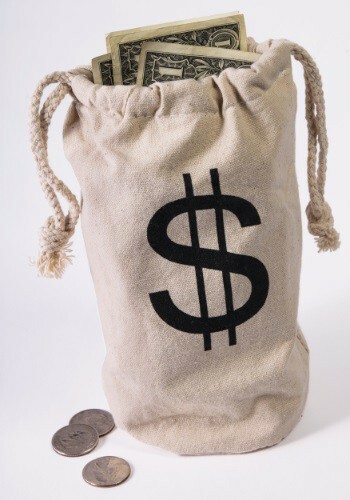 Take this Bag of Bank Money and run for the hills. You'll have a better life as a rich man. Just be sure to learn some basic business and investment techniques and you're good to go! The old west was a dangerous place when it was first being settled. There were bandits and outlaws up to no good robing from everyone. This meant that there had to be someone to keep the peace such as a sheriff. Now in some towns the sheriff was so good that crimes wouldn't happen. That everyday he would go to work and sit in his office waiting for a call to save the day but nothing would ever happen. These law enforcers would then sometimes grow in size and become quite large. So if you were a settler back in the old west days you knew a town was safe if the sheriff a bit a the heavy side! From biker to cowboy a pair of Black Fringe Cowboy Gloves is exactly what you need to spice up your costume. Show the world how macho you can be! Are you cool? Cooler than cool? Ice cold? Yeah, we thought so. This blue bandana is for cool guys. Cowboys and tough guys can probably get away with wearing these too, but those guys are cool guys too. 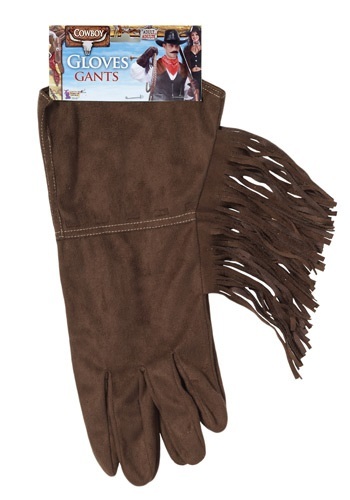 Wrangle cattle in style with a pair of Brown Fringe Cowboy Gloves. They're the perfect way to protect those manly hands from the wear and tear of the job. Or you know... to accessorize a costume! Tired of using plain colored bandanas while being a totally wicked outlaw? Have we got THE bandana for you. This burgundy bandana lets authorities and would be gangsters know that you're smooth, classy and tough. Is your home getting a little rowdy? Do you need a new law man to bring order to your family. It's time you promoted your kid to sheriff and let him handle justice. This Child Brown Cowboy Hat with Badge is the kind of symbol he needs to let all the rule breakers know that he's coming for them. Your kid may not be familiar with the wide open spaces of a farm or ranch. He might not consider where his food comes from before it arrives at the grocery store or know what it's like to walk barefoot through a field. 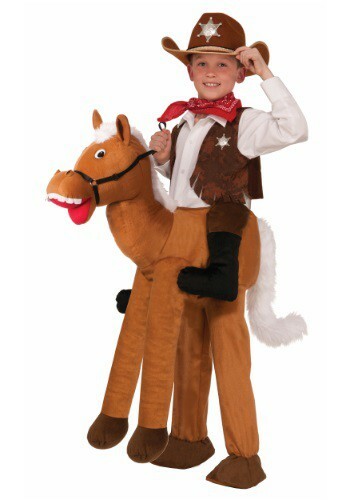 But he can have a true wild west experience with this child cowboy costume. It features all of the essential pieces needed to achieve a genuine cowboy look. It could be a first step toward getting him curious in life outside the city! YEE HAW!Being a princess in the wild west is a blast. You get to ride your horse all around the ranch all day long. You'll also get to play with all the cute farm animals and take care of them. 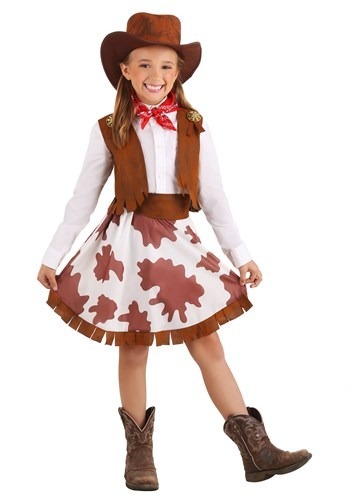 Now your little girl can show off her country side in this adorable cowgirl costume. Your daughter will charm any cowboy she meets when she wears this Child Cowgirl Sweetie Costume! Add boots and a toy six shooter to complete the look. What kid doesn't want to be a cowboy or cowgirl? 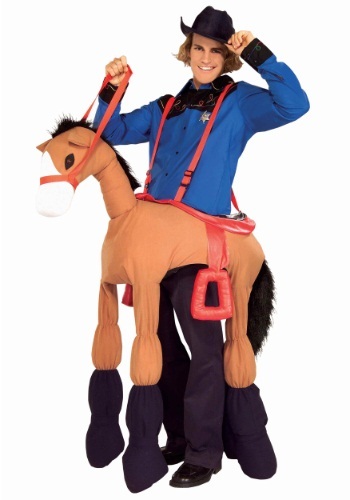 With this Child Ride-A-Horse Costume, that wish can become a reality! So get ready to head'em up and move 'em out, for the trail ride of a lifetime. It's a shoot out and this pretty cowgirl has fast fingers! 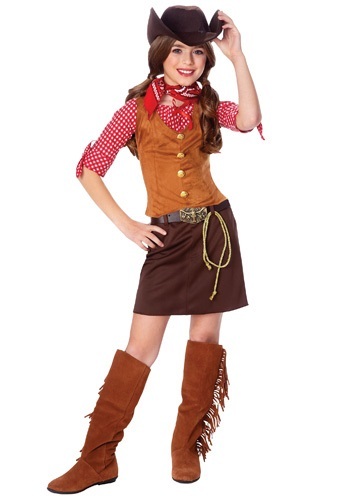 If your daughter loves old western and riding horses then this is the perfect costume for her. You get the best of both worlds: a cute cowgirl costume and a sweet princess costumes. She'll love the bright colors and fun fringe detailing! Saddle up! 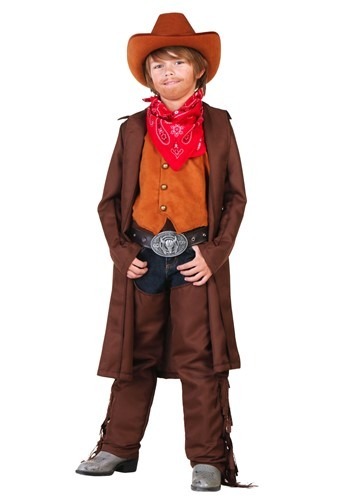 Get your little buckaroo ready to tackle the wild west with this cowboy costume. He might need to wrangle some horses to complete his task, but with this authentic look, it'll be a breeze. Whether he's looking to start a posse, or heading out solo he's going to have a great time as a classic cowboy with this costume! Does your girl have what it takes to conquer to western frontier? She'll be ready to tackle the wild west like no other with this Child's Deluxe Cowgirl costume. Any girl will love wrangling and ranching, and laying down the law once in a while. Get her suited up with this great costume! Nothing says I ride a horse to work like a pair of Cowboy Spurs! 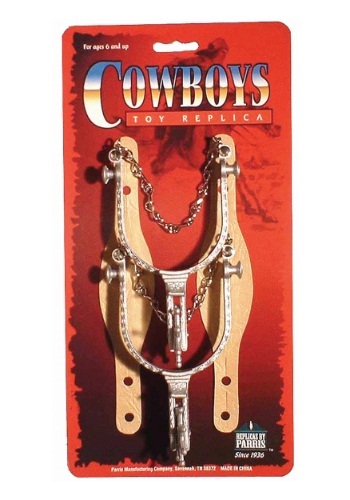 If your child pictures them-self as a cowboy or sheriff in the old west, these spurs will be the perfect addition to their costume. The only question they'll have to worry about with these on is "Where did I park the horse?" If you want to be the law around these parts, you’re going to need a masculine lip cozy that screams I’m the boss. The Cowboy Mustache may not have grown from your face but it’s the closest thing to manly this side of town. 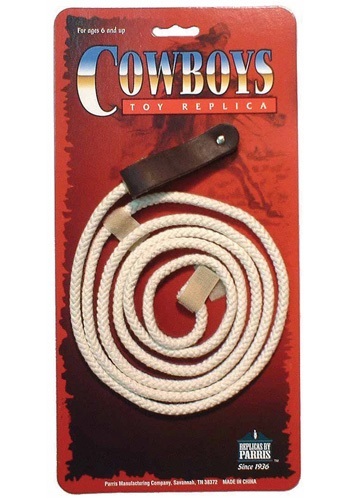 Remember, cowboys and cowgirls need to know how to rope and ride, so get your rope skills mastered with this handy trick rope accessory. It will turn any novice into a master! With a pair of Deluxe Cowboy Spurs, you'll finally be ready to ride off into sunset. But first you're going to need a Western costume, a horse, riding lessons, a trusty companion who will also need an animal, and a deserted town in the middle of no where. Hey this whole riding off into the sunset thing takes a lot of work. If you're a cowboy with plans to ramble and roam, be sure to protect yourself with a trusty weapon. 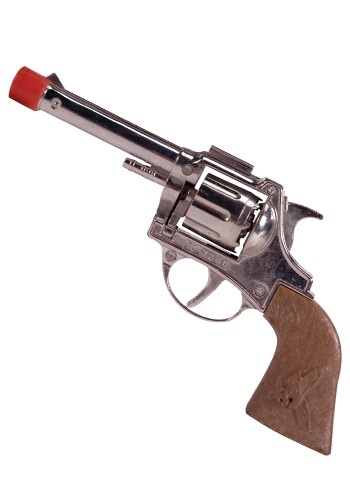 This die cast cap gun has the realism you're after while remaining a safe prop to add to your western themed costume. Giddyup! 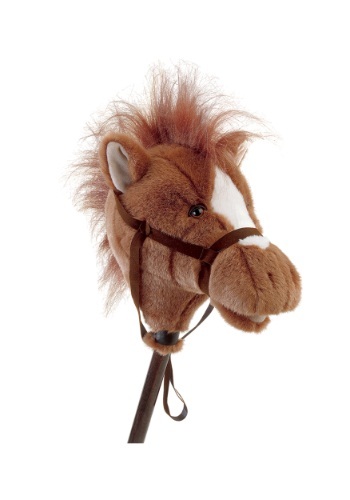 This Easy Ride'Um Brown Horse 33" Horse on a Stick will take your young cow-puncher anywhere he wants to go. If you want your child to have a retro, low-tech toy, this is it! Perfect to go with a cowboy or cowgirl costume. Who says horses have to be boring colors like black, white or brown? 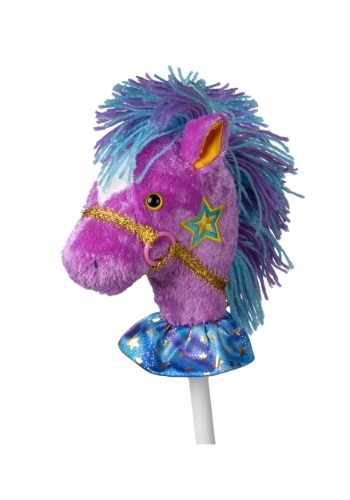 This Fancy Prancer Precious Pony 33" Horse on a Stick puts a fanciful twist on a classic toy. A fairy princess would love this horse! 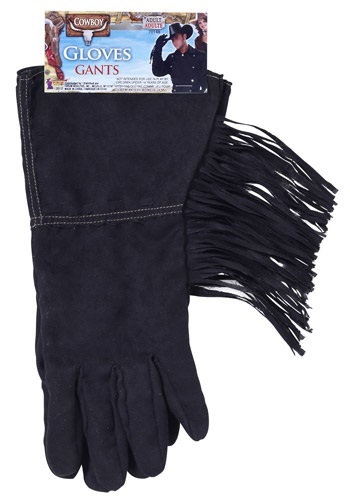 At your next rodeo be sure you're dressed to the nine with a pair of Fringe Cowgirl Gloves! It's a flirty way to complete your costume. You'll be welcome on any dude ranch in this Giddy Up Cowgirl Costume! Add western boots, a lasso and a six-shooter to complete your Old West look. 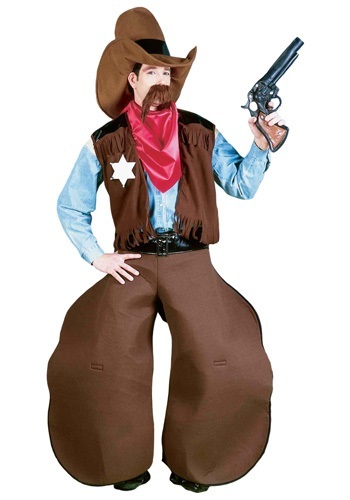 Partner this cute costume with any of our cowboy costumes for men! 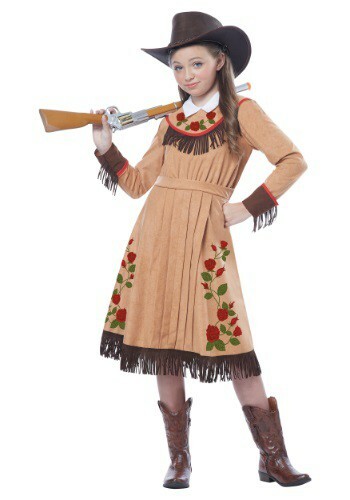 Annie Oakley had no problem being the top gal in the old west, and neither will your child when she wears this costume. She might not have the shooting acumen to be a master sharpshooter, but she can still wow all of her friends with a terrific western style. Arm her with a toy gun, and she might just become the marksman you've always needed in your household! Whether she wants to portray one of the iconic characters of the wild west or just spend a night in costume with her besties, she'll have a blast bringing history to life with this Girls Annie Oakley Costume! The bad guys won't know what hit them when they see this Cowgirl Cutie has just won over the hearts of the wild wild west! Get ready to rope cattle, drive them through fields, and then hang out in town afterwards in this Girls Cowgirl Cutie Costume. And don't forget to finish off this look with cowgirl pink boots! Well howdy there! This is an adorable cowgirl costume that comes complete with vest with attached shirt, skirt with attached belt, bandana, and hat. This costume is great for creative play! Pick up a toy lasso as a cute accessory to pair with this costume. She'll have a rootin-tootin good time tying up hogs and riding trick ponies. Too dangerous? Okay. Well maybe she can just wear this Girls Rhinestone Cowgirl Costume and pretend to be the star of the show. Your girl will be ready for the rodeo in this cute costume! It has a classic cowgirl mixed with a cute dress style. Rope em up! It's tough work being a cowgirl, but it's even tougher to keep a cute look while you're wrangling all of those cattle. 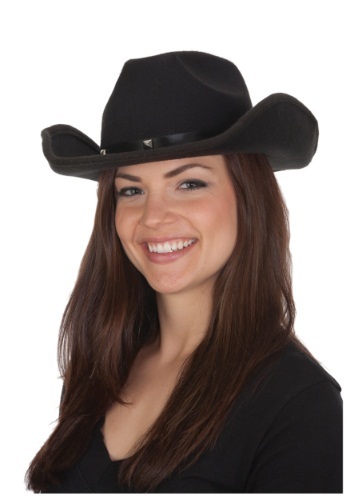 Suit your girl up in this Sweetheart Cowgirl costume, and she'll be ready to hit the ranch. We can't say for sure whether or not she'll enjoy the life of a cattle-woman, but at least she'll look adorable while doing it! Some call green the color of wealth. Others, the color of the genius people. Some just think it's lucky. We think it looks pretty snazzy on this bandana, so if you want to shake up your look with a wee bit of green, this will do the trick nicely. If you're searching for a quick an easy costume for your little one, this Hillbilly Costume will fit the bill. It's made of a super comfortable material and with photo-like details, it'll look like they are decked out in true redneck fashion. Finally your little buckaroo will be set for his trip to the wild west! Whether you've got high hopes for him as a western wrangler or just want to get him a great look for the big costume party, this romper will fit the bill! It has cool costume details, all printed in a one piece design. Let all the outlaws know that you are the cowboy in charge! 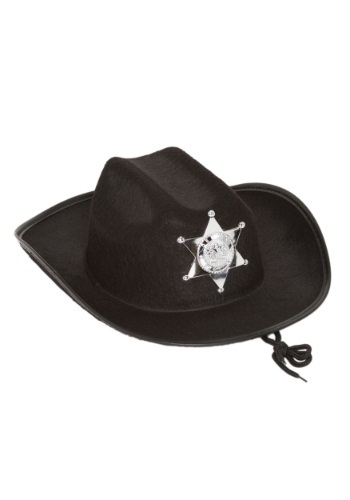 Wear this Kids Black Sheriff Hat and keep the Wild West as safe as possible. Every cowboy needs a horse, pistol, and hat. Horses are a little expensive... And pistols. Well, he's a little too young for one of those. Make his cowboy dreams come true with this Kids Red Cowboy Hat. "Mosey on lil' doggie cause this town ain't big enough for the two of us!" 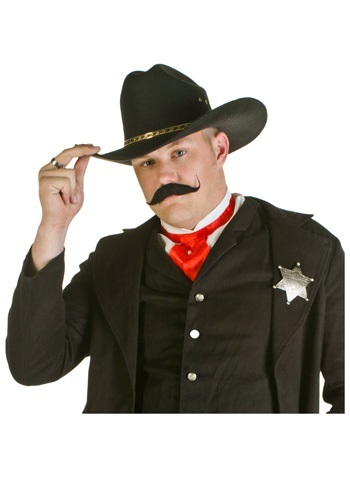 This Kids Sheriff Costume will turn you into the baddest sheriff in town, no bandit will want to mess with you! 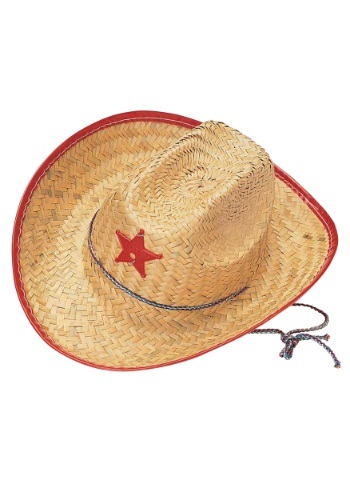 This complete costume even comes with the hat; just pick up some brown cowboy boots to complete the costume. If your child wants to be the sheriff in your neighborhood, he'd better be quick on the draw and have a hat that tells everyone in these parts who the law is. 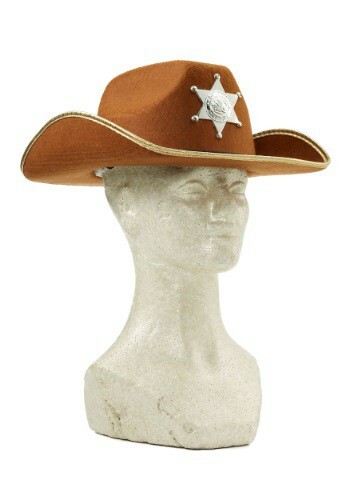 This classic cowboy hat has a sheriff star on the front, so everyone will know not to mess with him! Who is that masked man? He's you, when you complete your Halloween costume with this Lone Ranger Accessory Kit! Create a complete costume by adding our cowboy shirt, white cowboy hat, your own jeans, and a pair of cowboy boots. Recruit a friend to be your Tonto for a great duo! "Hi ho Silver, away! "In the wild west there is a masked man who always fights for justice and what is right and that man goes by the name the Lone Ranger. 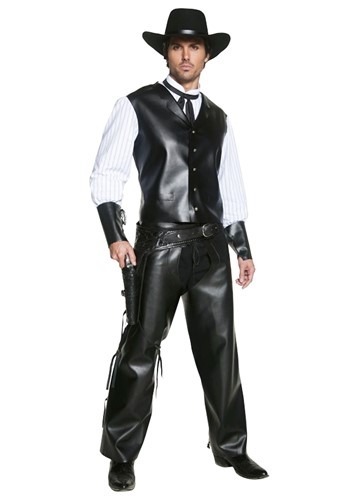 Now you can look just like he did in the 2013 summer movie with this great Lone Ranger costume. Just be sure to pick up six shooters to complete your look this Halloween! 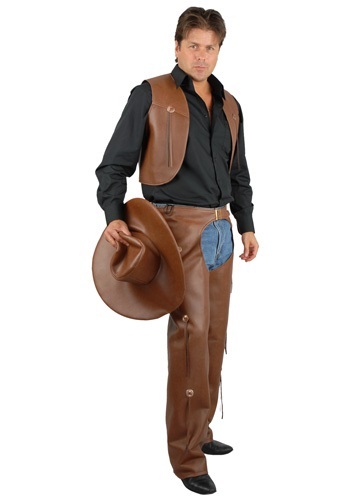 Giddy up cowboy, and wear this Men's Brown Chaps and Vest costume set! Wear them with your own jeans and western shirt, then add a cowboy hat and boots and you have the complete western look. A lasso and a toy six-shooter will give you your needed tools! If you love the roar of a Sunday crowd and the white-knuckle feeling that comes from riding a bull or a bronc, this Men's Rodeo Cowboy Costume is for you. 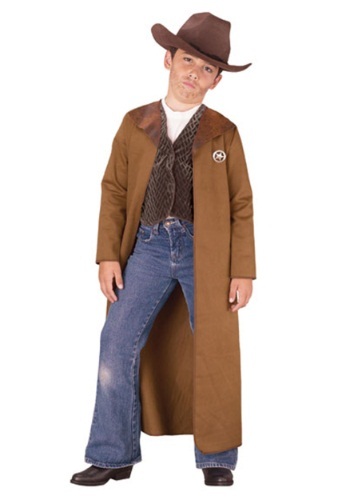 Even if you just like songs by Garth Brooks or Chris LeDoux, you'll still want this costume. It's perfect for chasing a dream they call rodeo!